At Singing Hills Golf Resort at Sycuan (formerly known as Sycuan Resort), you will be able to find great El Cajon golf deals, at this 54 hole golf complex, all designed originally by course architect Cecil Holingsworth. The Pine Glen Course, which opened in October of 1956, was the second of the three courses at Singing Hills Golf Resort at Sycuan to be opened. It is an 18 hole, Par 54, layout, which is beautifully tucked into the natural wooded California environment. In 1980, and again in 1991, the Resort underwent renovations to help aide flooding issues. Course architects Ted Robinson Sr. and Dave Fleming handled these remodels, and as a result, all three courses at Singing Hills Golf Resort at Sycuan now have Bermuda Grass on the fairways, tee boxes, and rough. The greens are a combination of Poa and Bent grass. At 2,508 yards from the back tees, the Pine Glen Course gives even skilled players a long iron challenge with two holes playing over 205 yards, both on the front 9. The Singing Hills Golf Resort at Sycuan has all the amenities you would expect from a full service resort. Dining, full service golf shop, lessons, practice area, all are readily enjoyed by those booking their El Cajon tee times here. 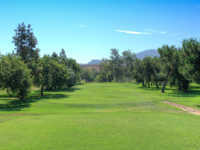 Singing Hills Golf Resort at Sycuan - Pine Glen Course discounts are regularly available, and others who have visited have shared how they felt the golf course was very nice, and how the whole golf course and common grounds were very scenic.